Revised and updated with 25 new essays, the fourth edition of this bestselling collection brings together more than 30 leaders in the field of educational theory. An engaging exploration of the ideas and trends shaping education in today’s classrooms, Philosophy of Education includes topics on high-stakes testing, consumerism in education, and social justice issues in the classroom. How can we teach students moral values while avoiding indoctrination? How should a teacher deal with controversial issues in the classroom? What role should standards play in education, and who develops those standards? And why is the link between theory and practice in the classroom important in the first place? 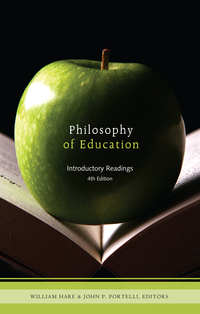 Philosophy of Education provides students, teachers, and administrators with a lively and accessible introduction to the central debates and issues in education today. William Hare, PhD, is a professor emeritus of education at Mount Saint Vincent University. He received his PhD from the University of Toronto. Dr. Hare has served as the editor of Paideusis, the journal of the Canadian Philosophy of Education Society, and in 2005 the CPES awarded him the Distinguished Service Award. John P. Portelli, PhD, is a professor of education and co-director of the Centre for Leadership and Diversity at the Ontario Institute for Studies in Education, University of Toronto. He received his PhD from McGill University. Frequently invited to give keynote addresses and do workshops both nationally and internationally, Professor Portelli is also actively involved in higher-education policy work in Europe. 9 Eugenie C. Scott, What’s Wrong with the “Teach the Controversy” Slogan? 25 Maxine Greene, Literacy for What? © De Marque - website copyright. Including + (AND) between each term will only return publications that contain all search terms. Including | (OR) between each term will return publications that contain at least one of the search terms. Enclosing a word or phrase in quotes (" ") will only return publications that include the exact search term. Inserting an asterisk (*) after the stem of a term will return publications that include all possible endings of that term.